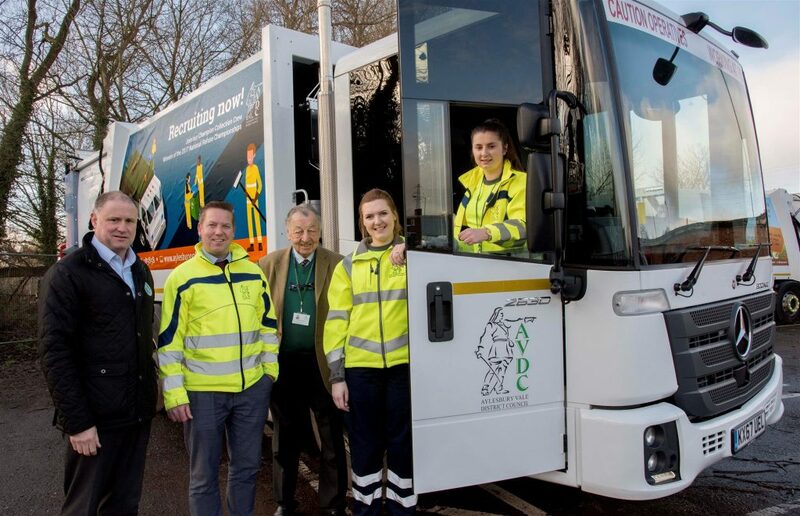 L to R – Spencer Law, RVS; David Clark, Transport Manager, Aylesbury Vale District Council (AVDC); Cllr Beville Stanier, Cabinet Member for The Environment & Waste, AVDC; with members of the 2018 all-female National Refuse Championships team – Amy Bridgeford, Operations Team Manager, AVDC; and Abigail Friston, Trade Waste Supervisor, AVDC. Aylesbury Vale District Council is preparing not one, but two teams, to defend its title as National Refuse Champions (2017) at the annual event, which takes place on 16 June 2018 at Weston-super-Mare seafront. Demand from the council’s female loaders and drivers means that they will have their own team. A charity event, the National Refuse Championships (NRC) was *revived last year for the first time in over 10 years by Refuse Vehicle Solutions Ltd (RVS) and took place at Weston-super-Mare on Saturday 10 June 2017. 18 teams took part including Biffa, Amey, Kier, Hills Waste and Swindon Borough Council, and over £12000 was raised for the Alzheimer’s Society. Such was the success of the event that over 30 teams are already signed up to take part in 2018. Places are still available although going fast. Aylesbury Vale District Council was so proud of winning the event that it is featured in its current recruitment campaign. The slogan ‘Recruiting Now! Join Our Champion Collection Crew – Winners of the 2017 National Refuse Champonships’ is being advertised on the side of some of the council’s new fleet of state of the art refuse vehicles. For more information about this year’s event visit www.nationalrefusechampionships.co.uk. The event starts on Friday 15 June with an exhibition and networking event run by RWM, which includes key speakers and seminars followed by an evening of entertainment. The refuse vehicle team races run from 10am until 4pm on Saturday 16 June followed by a party with live music. To enter a team or make a donation contact tracy.standing@rvsl.co.uk or contact Tracy on Tel: 07772 500 736.